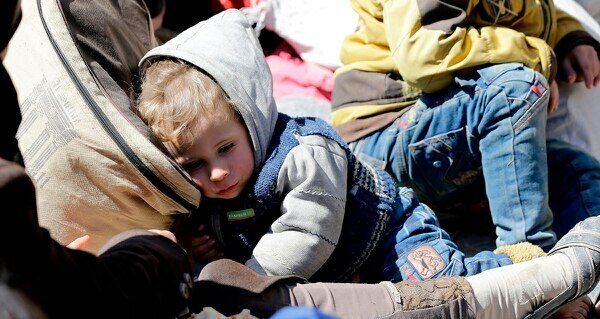 BEIRUT (AP) — Syrian troops captured a major rebel stronghold east of the capital Damascus Saturday and took large parts of another, squeezing insurgents and forcing thousands to flee to regions controlled by the government. The Britain-based Syrian Observatory for Human Rights and Oways al-Shami of the Syrian Civil Defense said troops have taken Kafr Batna and large parts of nearby Saqba. The capture of Kafr Batna and parts of nearby Saqba is another blow to opposition fighters who have lost more than 70 percent of the area known as eastern Ghouta since the President Bashar Assad’s forces began a crushing offensive under the cover of airstrikes on Feb. 18. The violence left nearly 1,400 people dead, more than 5,000 wounded and forced tens of thousands to seek shelter in areas under government control. 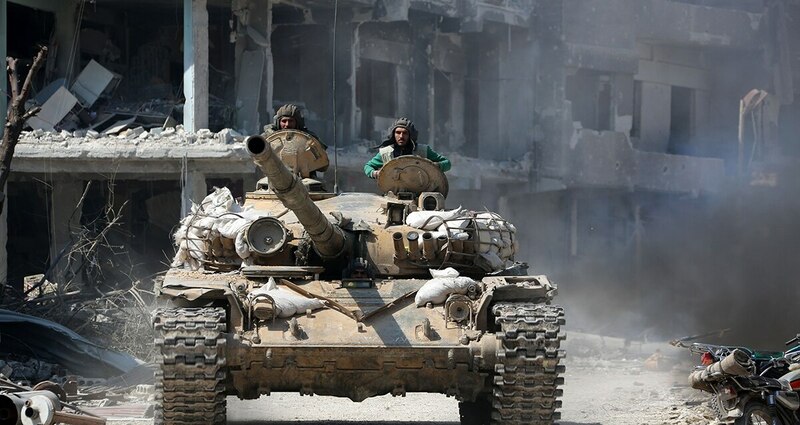 Syrian state news agency SANA said the army stepped up military operations in eastern Ghouta and inflicted “heavy losses on terrorist groups in personnel and military hardware.” It said troops reached the center of Kafr Batna and Saqba. Russia’s Foreign Ministry says the West’s angry reaction to a nerve agent attack in Britain is connected to the war in Syria. With the capture of Kafr Batna and parts of Saqba, rebels still control the towns of Arbeen, Zamalka, Ein Tarma and Jobar on the southern edge of eastern Ghouta. Eastern Ghouta has been split to three parts — the largest rebel-held town of Douma to the north has been cut off from nearby Harasta, and both have been split off from the rest of the area. The opposition’s Syrian Civil Defense said the airstrike killed dozens and wounded scores, adding that paramedics are trying to help survivors. Speaking about the capture of Kafr Batna, al-Shami of the Syrian Civil Defense said people “fled in the streets not knowing in which direction to go.” He added that large numbers of people have now been squeezed into the small areas held by rebels in eastern Ghouta. 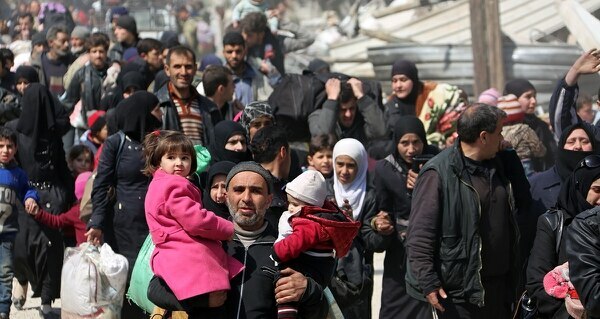 The violence came as thousands of people left eastern Ghouta and entered government-held parts of the region on Saturday, bringing to 47,000 the number of people who left the area over the past three days, according to Russia’s Defense Ministry. Air Force Chief of Staff Gen. Dave Goldfein speaks about concerning actions by the Russian air force over Syrian air space. Russia’s Maj. Gen. Vladimir Zolotukhin was quoted by Russian news agencies as saying that some 3,000 people have been leaving every hour Saturday through a government-run humanitarian corridor monitored by the Russian military. Zolotukhin is spokesman for the Russian center for reconciliation of the warring parties in Syria. In other parts of the country, Turkey’s military rejected allegations it bombed a hospital in Afrin in northwestern Syria, where it’s engaged in an offensive against Syrian Kurdish fighters. The military tweeted aerial footage and photographs of the town’s general hospital it said were from Saturday morning, showing it was intact. The army said in a statement that the Syrian Kurdish People’s Protection Units, or YPG, were trying to create a “negative perception” of the Turkish military. Turkey launched an offensive against the YPG on Jan. 20 to clear Afrin. The country considers the YPG a terror group and a wing of a Kurdish insurgency operating within its own border. The agency added that Turkish troops and allied Syrian opposition forces have captured 224 villages and 44 “critical points” since the operation began. Turkey’s state-run Anadolu agency said Turkish troops heading from east to west and troops heading west to east have linked up in northern Afrin. “Afrin is being exterminated and destroyed. Human beings in Afrin are being killed,” he said.